There is nothing quite like crisp, cool cucumbers for summer salads, refreshing drinks and, of course, homemade pickles. While they are easy to find at grocery stores, produce stands and farmers markets, it is much more fun – and they will taste even better – when grown in your own garden. While they are relatively easy to grow, there are a few things to know about how to grow cucumbers to help ensure success. Follow this guide and you are sure to have plenty of cucumbers for side dishes, salads and pickling. Cucumber plants prefer full sun, so you will want to choose a spot in your garden that receives at least eight hours of sun each day. However, while cucumbers do like warm weather, they do not like extreme heat, so if you live in an area where it is regularly in the 90s, choose a spot that offers some partial shade in the afternoon to protect them from the heat. You will also need to select a spot with plenty of space for your cucumber plants to grow. If you are growing bush varieties or will be using a trellis for vining varieties, then your plants will not take up as much space, but vining varieties that are allowed to grow along the ground need lots of room. Cucumbers are heavy feeders that prefer moist, well-draining soil. You can increase the nutrients in your soil and improve its structure by mixing in compost before planting. 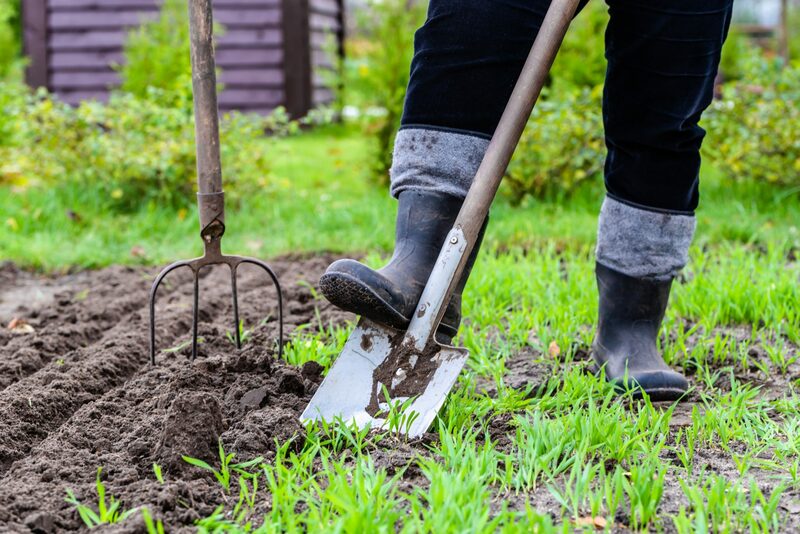 If you are working with the clay soil that is common in Southern California, it is particularly important to mix in several inches of organic matter to improve drainage. It is best to plant cucumbers from mid-spring to early summer. If you are growing bush varieties or vining varieties that will be trained on trellises, you can plant your cucumbers about 18 inches apart. If you are growing vining varieties without trellises, you will need to plant your plants about 36 to 60 inches apart. You can either start your cucumbers in the ground by pushing the seeds about one inch into the soil, or you can transplant young plants from the nursery or that you started indoors. Cucumber plants tend to take up a lot of room, but if your backyard only allows for small-space gardening, you can grow them in containers. You will need to choose a compact variety for the best results. You can do this by comparing the information on various seed packets or by getting help from a knowledgeable staff member at your local garden center. The next thing you will need is a large pot for each cucumber plant. The larger the container the better, so choose something that is at least the size of a five-gallon paint bucket. In fact, you can even use five-gallon buckets for growing cucumbers, but some gardeners recommend growing food plants in containers that are not made of plastic. You will also need a trellis to train the vines on to help contain your cucumber plant and ensure proper air circulation and sun exposure. For the soil, fill your container with a mix of well-draining garden soil and compost. Cucumbers thrive with plenty of nutrients, so mixing in compost will help set you up for success. You can side dress your cucumber plants with more compost throughout the growing season to continually add nutrients. 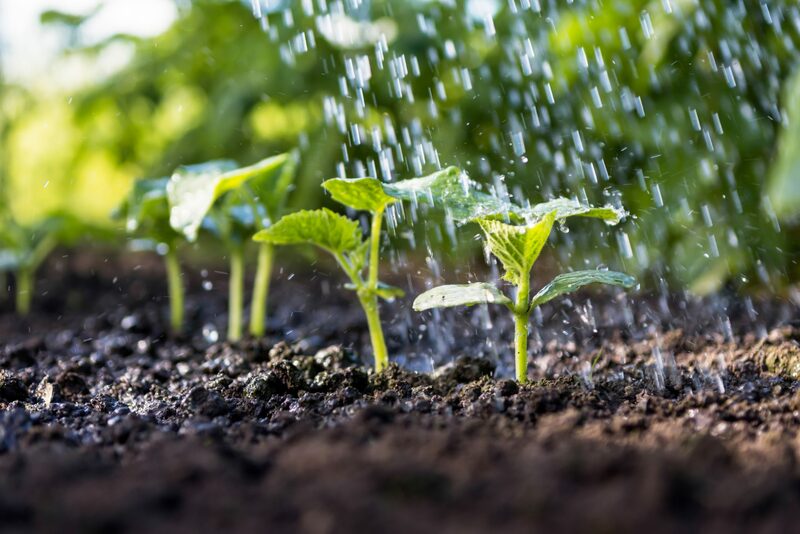 Soil in containers dries out faster and some types of containers dry out faster than others, so you will need to check the soil regularly to determine the best watering routine. Cucumber plants are heavy feeders and prefer moist soil, so you will need to stay on top of feeding and watering them. Start them off right by mixing at least a few inches of compost into your garden soil. Once established, side dress your plants with compost at least once per month to continuously add nutrients to the soil. Cucumbers typically require weekly watering, but will need more during the hot, dry months of summer. You can help the soil retain moisture by adding a layer of mulch. You will also need to regularly pull any weeds that appear so that they will not compete with your cucumbers for water and nutrients. The most common issues you will face growing cucumbers in a backyard garden are cucumber beetles and powdery mildew. Cucumber beetles are generally most destructive when your seedlings are first emerging, so an easy way to prevent this problem is to start your plants indoors and transplant them into your garden after they have grown into young plants. Alternatively, you can purchase young plants from a local nursery to transplant in your garden. If you want to start your seeds in the ground, use row covers to protect your plants as they mature. You will need to remove the row covers as soon as you start seeing flowers to allow for pollination. Powdery mildew is a common fungus that weakens plants, reduces production and is easily spread throughout your garden. At the first signs of this white, powdery coating, remove any affected leaves and throw them away. Do not compost them. You can help prevent powdery mildew from taking hold in your garden by watering early in the day, irrigating close to the soil to avoid wetting the leaves, pruning plants to increase air circulation, and spraying your plants with neem oil or a mixture of about one teaspoon baking soda per one quart of water. Leaving cucumbers on the vine too long can result in bitter fruit and reduced production; therefore, it is important to regularly harvest your cucumbers to encourage your plants to grow even more. Forget about the huge cucumbers you see at the grocery store; backyard cucumbers usually should be picked while they are small, particularly if they are pickling varieties. 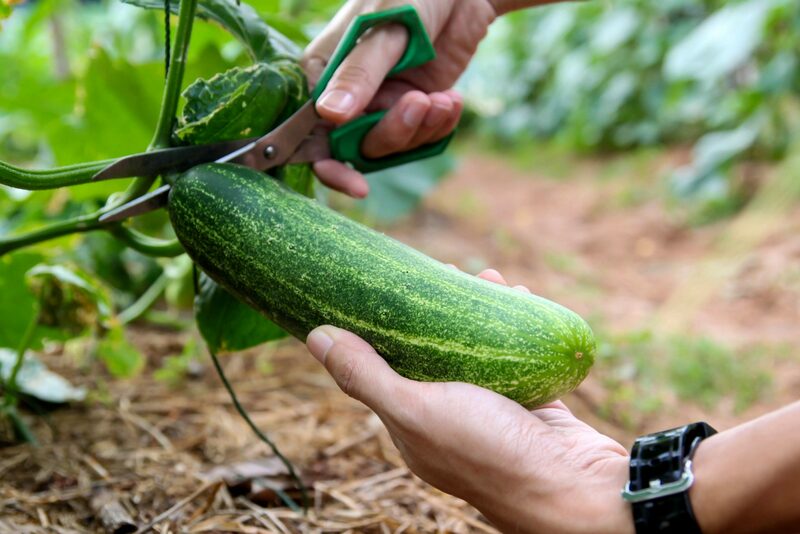 If you are growing slicing cucumbers, you may be able to leave them on the vine until they are six to eight inches in length. Keep your seed packets or mark maturity dates on your calendar so you will know when to start harvesting each variety. Use kitchen shears or pruning shears to cut the fruits from the vine. Cucumbers can be stored either on the counter or in the refrigerator. Most people like cold, crisp cucumbers and, therefore, prefer to keep them in the fridge. If this is your preference, make sure they are completely dry, wrap them in a paper towel and place them in an unsealed plastic bag. Cucumbers are extra sensitive to ethylene, so on the counter or in the refrigerator, they should be stored separately from bananas, melons, apples and other big ethylene producers. While they will not be chilled, cucumbers will last longer if they are stored at room temperature in a spot with good air circulation, such as your kitchen counter. Cucumbers can also be pickled for longer storage. Cucumbers are crisp and refreshing, which makes them the perfect produce pick for cooling salads and beverages. One easy way to use the cucumbers from your garden is to slice them and place them in water with a bit of fresh mint. For an even more refreshing elixir, try adding sliced cucumber and mint to sparkling water instead. And, for an adult beverage with a cucumber twist, add sliced cucumber to your next gin and tonic. For a simple cucumber and tomato salad, cube about three cups of cucumber and mix with about one cup of halved cherry tomatoes and one-quarter cup chopped red onion in a bowl. Drizzle a little olive oil and vinegar over the mix and add salt and pepper to taste. Gently mix the ingredients to coat each piece evenly, serve and enjoy. For a creamier salad, replace the olive oil with about one-quarter cup sour cream and about two teaspoons of fresh dill. Whisk the sour cream, vinegar, dill, salt, and pepper before adding them to the bowl with the cucumber, tomato and onion. Mix gently to coat, serve and enjoy.